An aerial view shows the 44th Street station that will offer a link to Phoenix's larger light-rail system. PHX Sky Train will begin service April 8 and was being tested this past week. PHOENIX - Starting April 8, travelers can catch a free, air-conditioned ride aboard the new PHX Sky Train to get to Sky Harbor Airport from either a light-rail station or an economy parking lot. 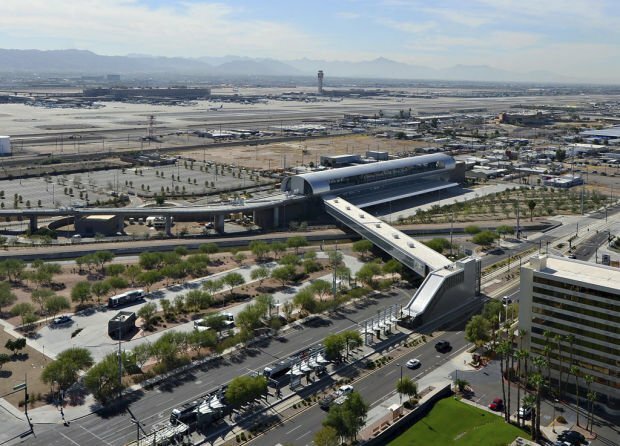 The first phase of the $1.6 billion project connects with Terminal 4 - which handles 80 percent of Sky Harbor's passengers - and includes stops at the East Economy parking lot and at the Metro light rail station at 44th Street and Washington. The driverless cars, leaving about every three minutes, will make the trip in about half the time of the current shuttle buses. A bridge that crosses 100 feet over a taxiway, enough to clear the tallest jetliners, will enhance the experience, said Julie Rodriguez, spokeswoman for the airport. "It should be a really great ride for passengers," she said. The trains will reduce congestion from the 108 buses that currently transport passengers around the airport, officials said, while the station connecting with light rail emphasizes convenience and incorporates sustainable features and public artwork. 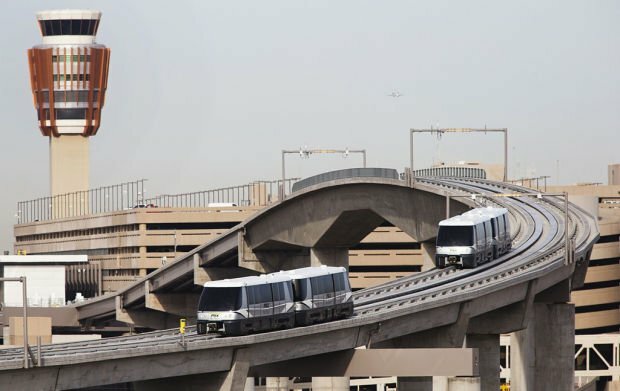 "The Sky Train is going to serve the airport really well to move passengers really efficiently from point to point," said Steve Grubbs, a Phoenix Aviation Department special projects administrator. US Airways and Southwest Airlines will offer free early bag checking at the light-rail and East Economy stations in a pilot program. Passengers will also be able to print boarding passes at kiosks from participating airlines. Grubbs said the PHX Sky Train was designed to create flexibility for future expansions and modifications. Officials plan to extend the train to Terminal 3, with a walkway to Terminal 2, by 2015. The light-rail station's public art features mosaic-like designs in the flooring and a vibrant blue ceiling structure outside, paid for by a required 1 percent allocation in the budget. The work of seven artists is displayed at the stations. • It will take three minutes to travel from the 44th Street and Washington station to East Economy parking and another two minutes to reach Terminal 4. • Trains will run continuously in both directions and arrive as frequently as every three minutes. • Eighteen train cars will be assembled into two- or three-car trains. • Each car holds 53 passengers. • Trains will run automatically without drivers.